Flowers Archives - Pebbles, Inc.
Hello everyone! 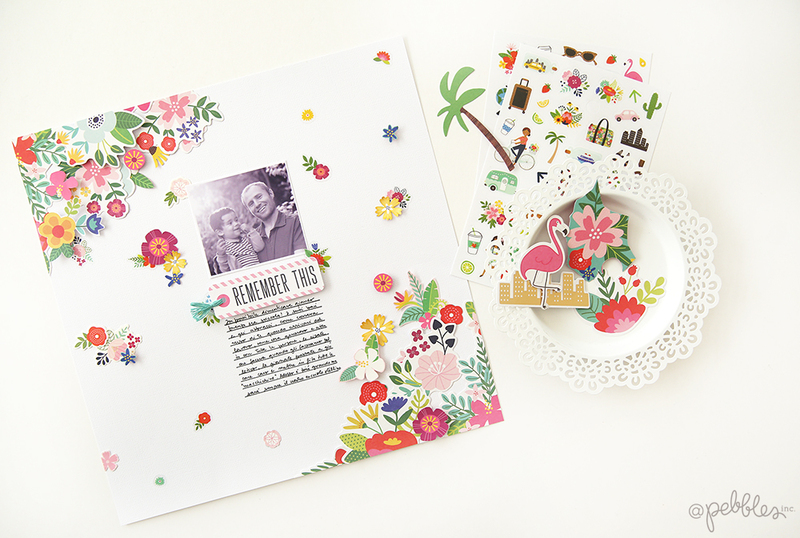 It’s Eva on the blog today sharing a step by step floral layout using the Chasing Adventures collection. 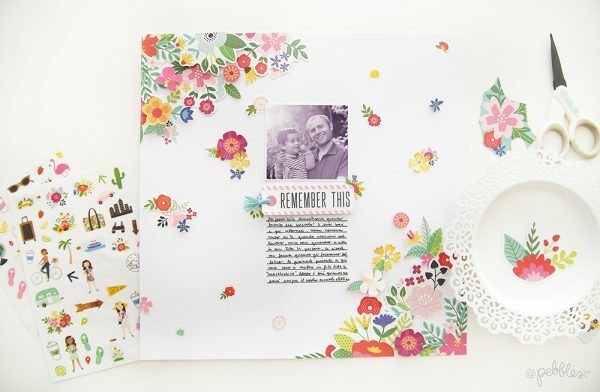 Flowers are a must have on every collection and the ones from the Chasing Adventure line are gorgeous! Tropical, with beautiful colors and perfect to document your vacations! 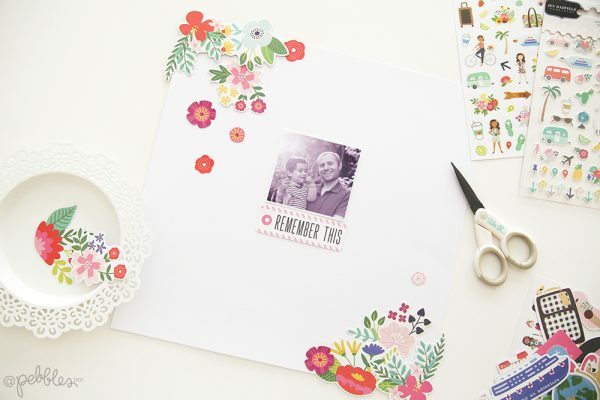 Today, I decided to use them to create a floral layout with a picture of my little boy and my husband. 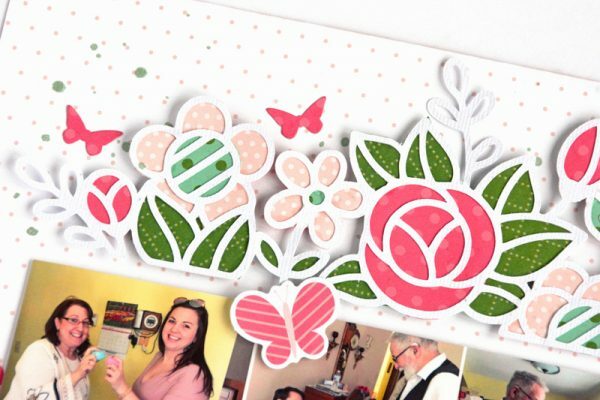 To create the layout, start by gathering all your supplies that have floral designs, you can use: papers, stickers, die cuts and small embellishments. 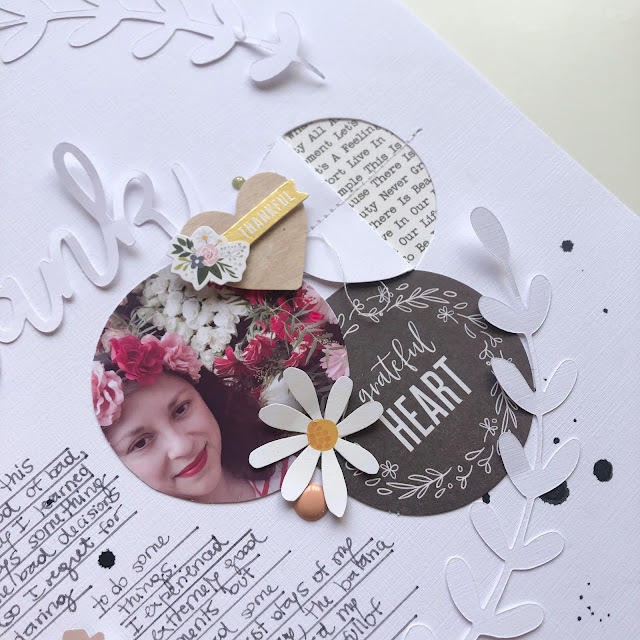 I used some die cut flowers and also fussy cut some flowers from the beautiful patterns in this collection. I arranged my flowers in two groups: One going down on the left side of my page and one going up on the right side of my page. I added more flowers on the beginning of my cluster and put less as I moved up or down. 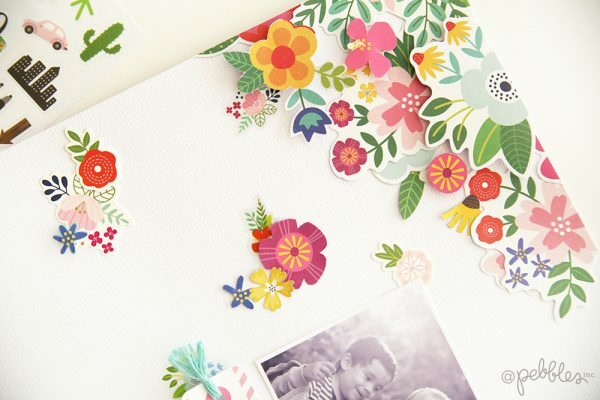 Tip: use the 6×8 paper pad to fussy cut some flowers on a smaller scale. 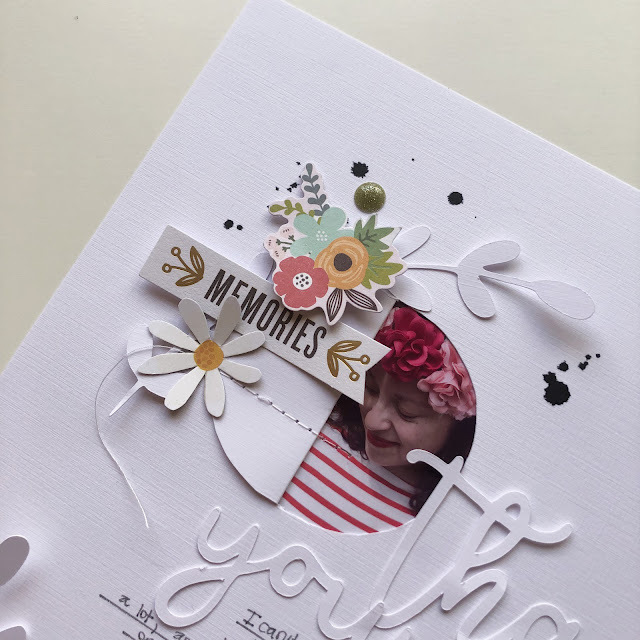 I added my photo and a die cut with the words “Remember this” as my title, I love the small tassel on the die cut, it is so much fun! To give a little more dimension to my layout I added some flowers with 3d dots, even some small ones! I also curled some petals from fussy cut flowers. The final step was my journaling, I wrote some words underneath the title with thing I want to remember about my son. The clusters on the edges turned out great! It looks as the flowers are falling down and the two cascades frame my picture. I love to use flowers for every day layouts, even masculine layouts! How about you? Do you use flowers when you scrap the men in your life? Thanks for joining me today and have a great day! Hello Pebbles friends! Marcia here today. 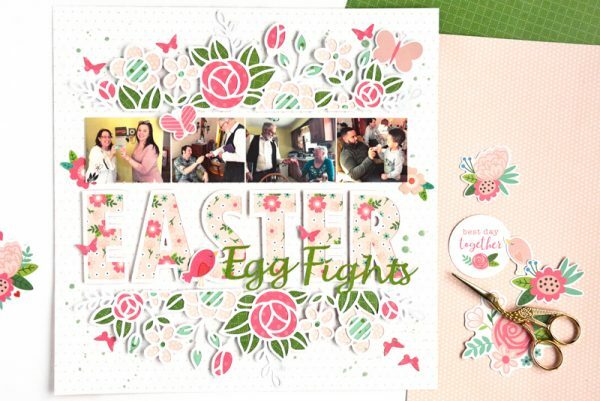 I am sharing an Easter layout with you today created with the Pebble’s Loves Me collection as well as the Chasing Adventures collection. I love the floral patterns in the Loves Me collection. 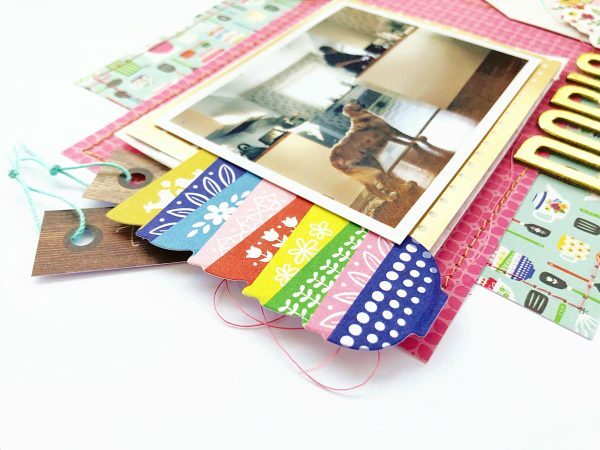 They work perfectly for Spring projects too. It’s definitely not just another Valentine’s Day collection. I wanted to use green pattern paper too though. In Spring everything becomes green again. I found just what I needed in the Chasing Adventures collection; a light green polka dot pattern as well as a darker green plaid pattern. 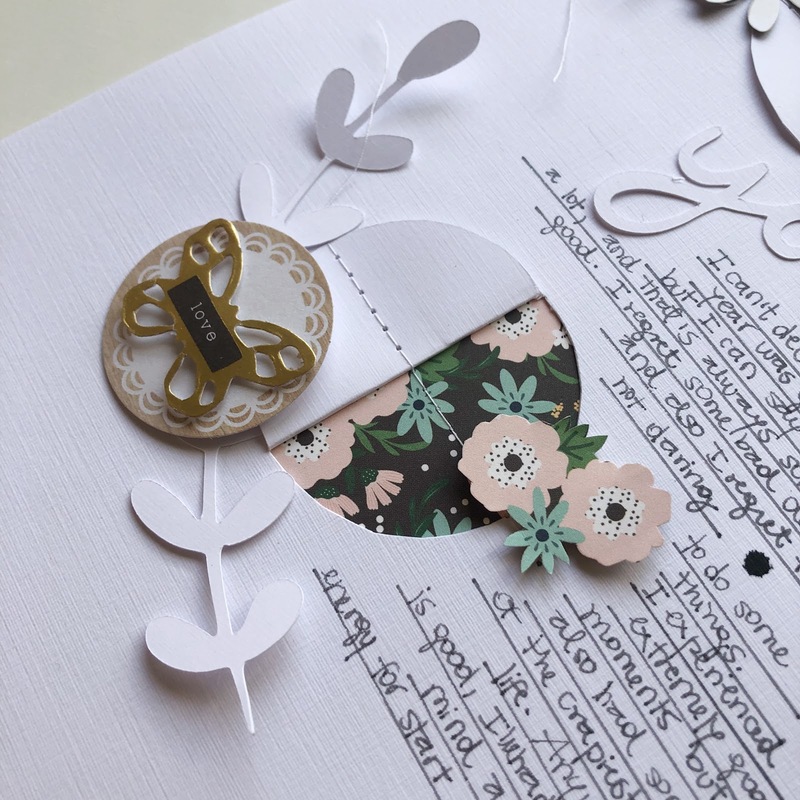 I used the pattern papers to fill in the negative space in a gorgeous floral cut file as well as the inside of my alphas in my title. 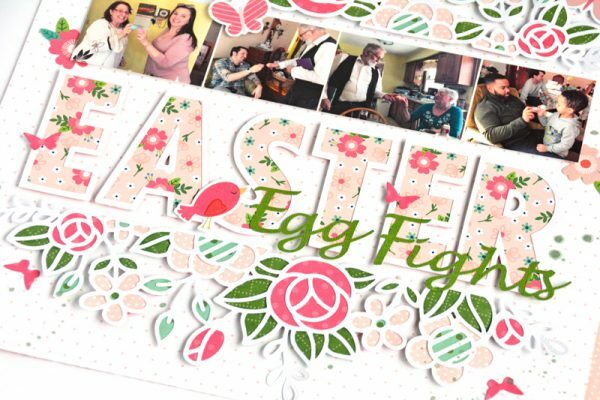 When my extended family gathers for Easter, it’s a tradition for us to hold an Easter egg fight tournament. 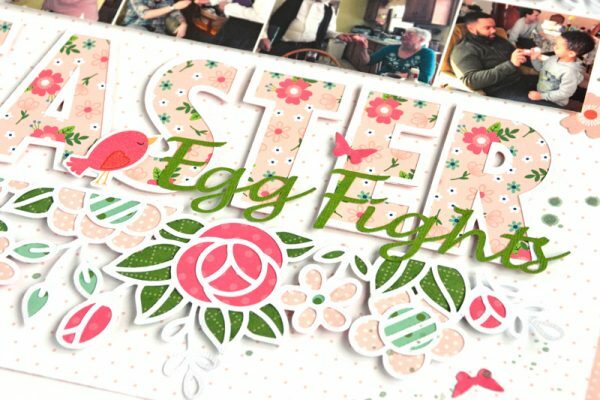 I created a large EASTER title to span my page. Then I used a script font to complete the title. I love combining fonts to make my titles more interesting and dramatic. 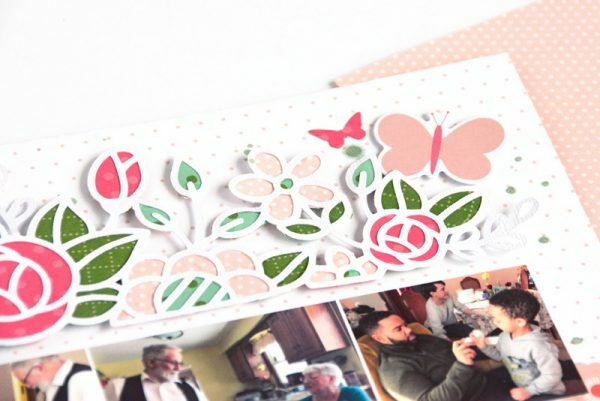 I added a bird from the Loves Me ephemera pack and a few punched butterflies as well. Backing cut files with pattern papers is a fabulous way to use up paper scraps. I added some foam tape behind the cut file to pop it up from the background paper. 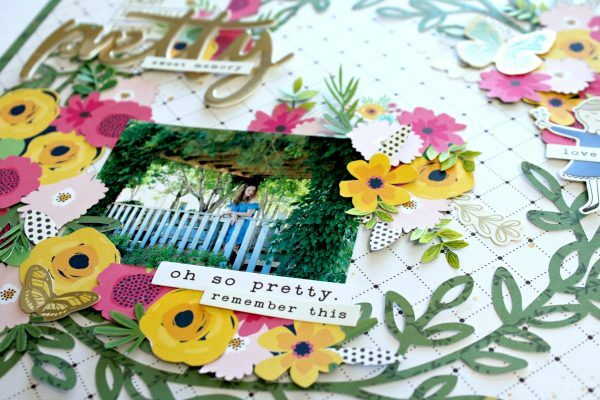 What a beautiful way to use scraps, don’t you think! Have a great week. Hello everyone! 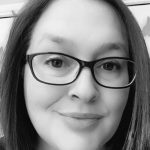 Caroli Schulz here, I am very excited and thankful for this opportunity to be a guest designer for Pebbles. 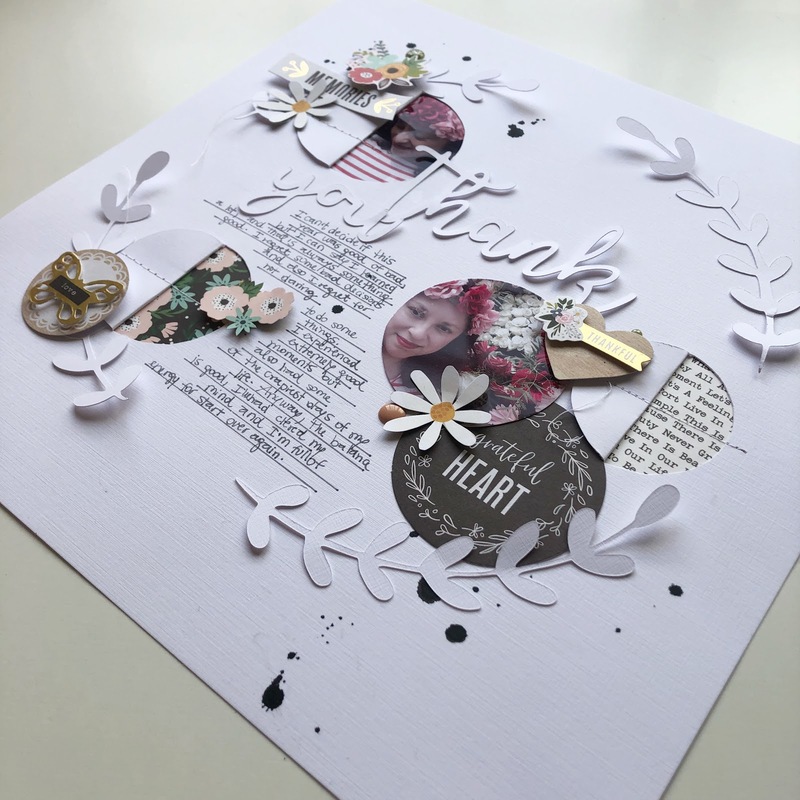 Today I want to share a simple layout I created using the beautiful Along the Way collection by Jen Hadfield. 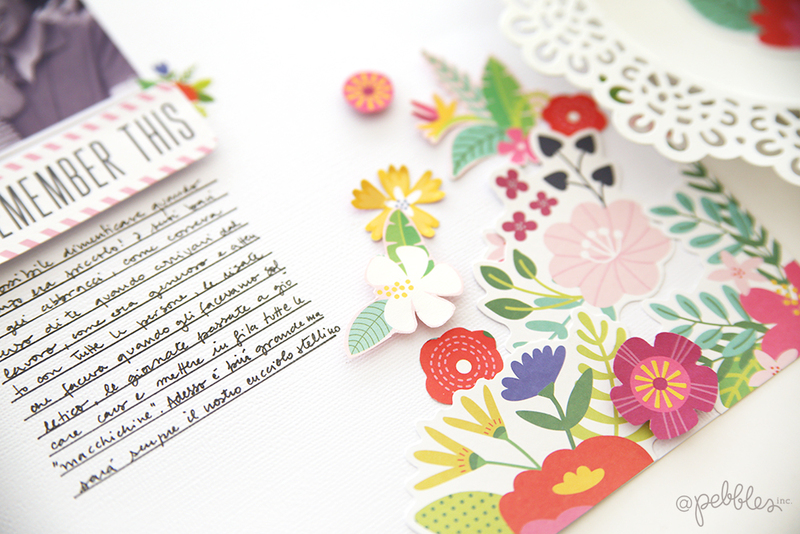 I love the colors and patterns of this collection, as well as the sweet and feminine details. It was perfect for using few pics of myself I’ve been hoarding for some time, waiting for the right collection. In this layout, I went for a really clean and simple approach, but with few pretty details in order to make it special. 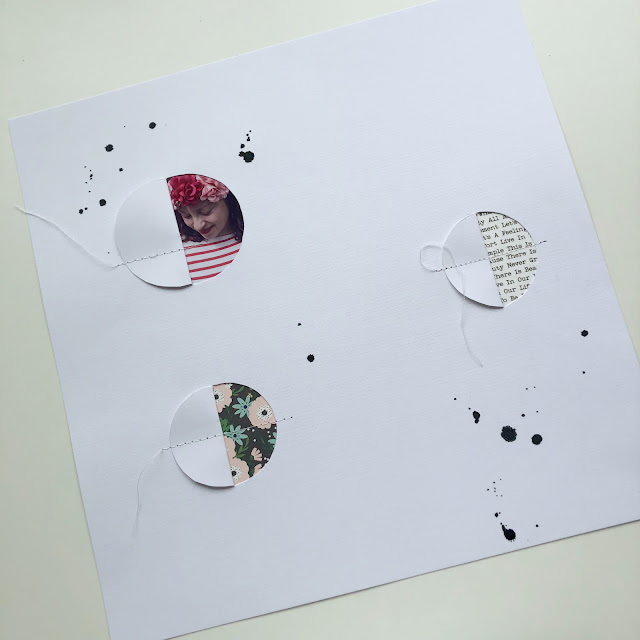 My idea was to create some kind of wreath, and include half-cut circles on it. To start, I drew a few half circles on my page. 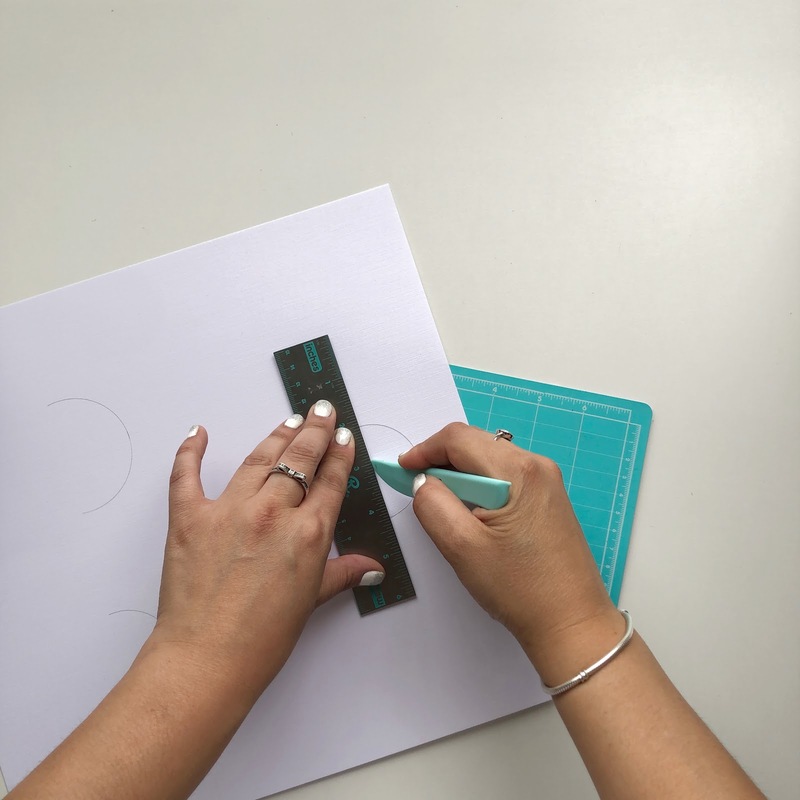 Next, I used a cutter to actually cut the shapes I drew before; if you have an electronic cutting machine you can use it too for this purpose. 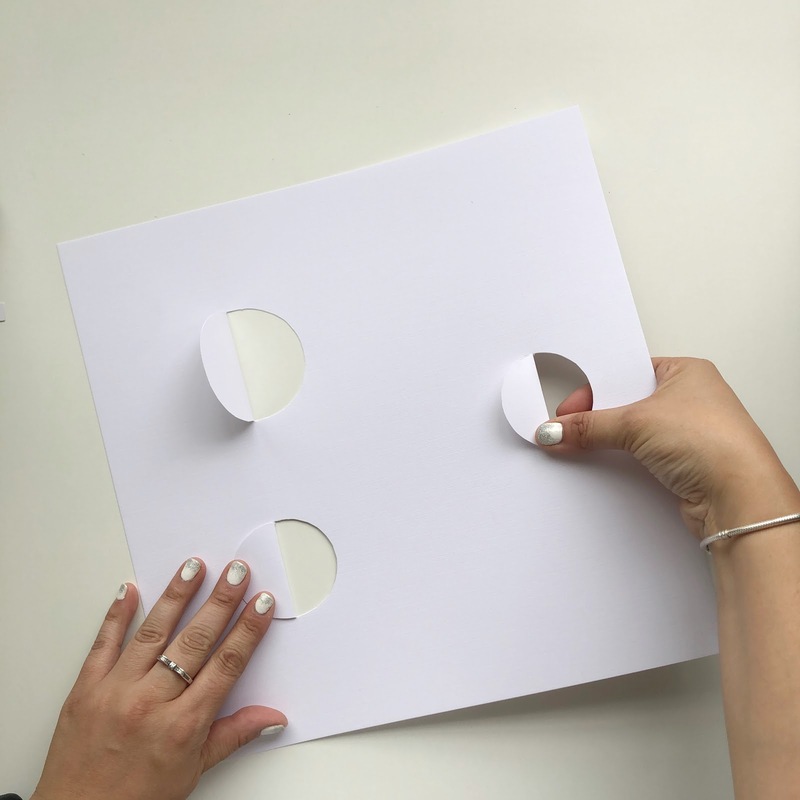 Now that all the halves of circles are cut, we will use a scoring tool and fold them; this way, we will have some kind of windows that can be filled with photos or patterned paper. With this base, I created a layout with a wreath design, using some leaves I cut with my electronic cutting machine. 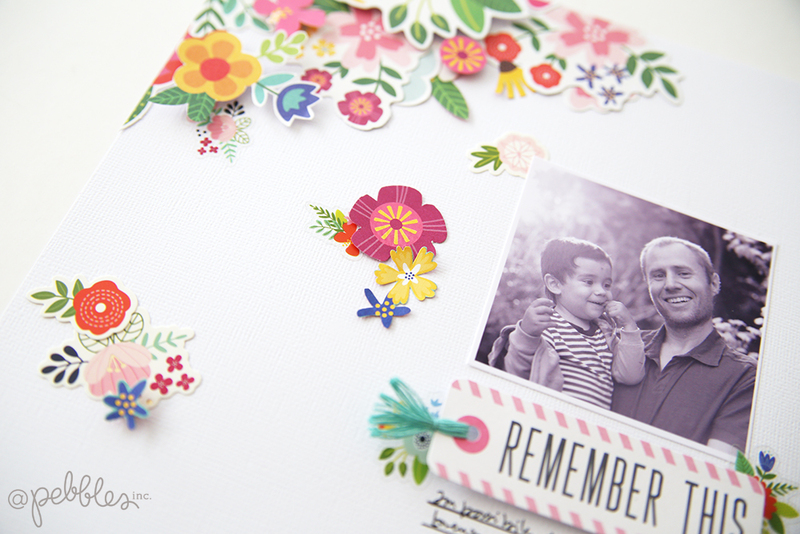 As a focal point, I created two embellishments clusters on the top left and bottom right of the page. I like to keep things balanced and symmetric. 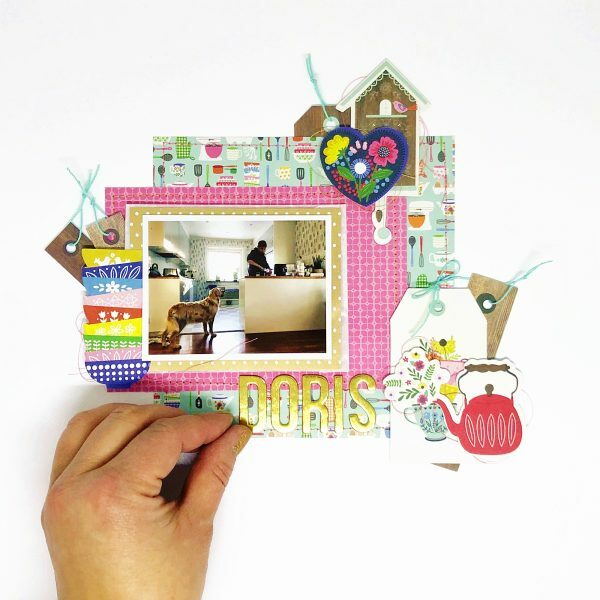 Here you can see I filled one of the windows with a photo and used the sewing machine to stitch over it and add an extra detail to the cluster. On the bottom cluster I also added a round shaped photo, and some more embellishments. Fussy cutting is my fave technique when it comes to embellishing, so I cut few flowers from the gorgeous patterned papers of this line. 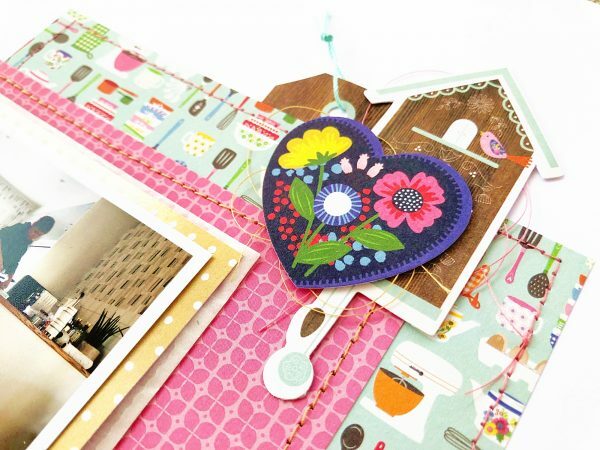 I love simple pages but with lot of texture and volume, and this is exactly what I did here. 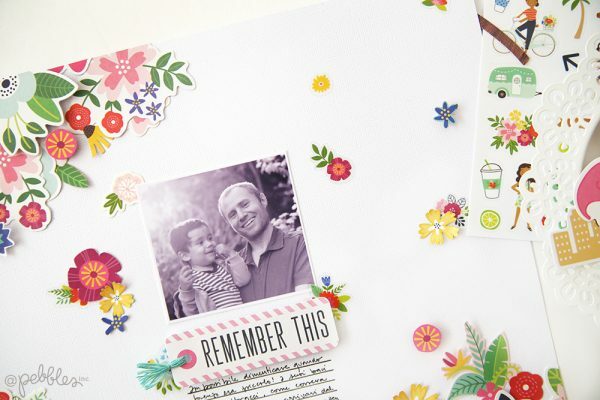 The page looks fun but not overwhelming, don’t you think? 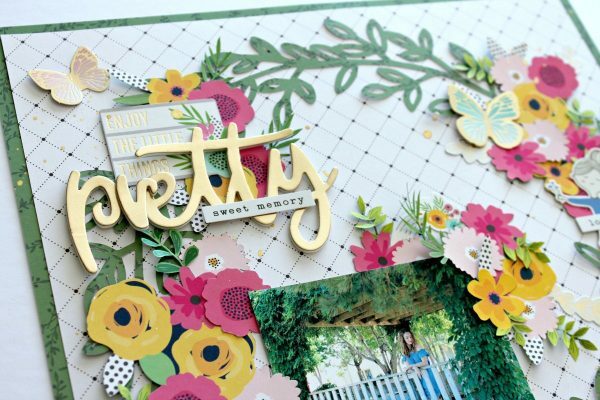 I love the gold accents on the 3D embellishments of the Along The Way collection. 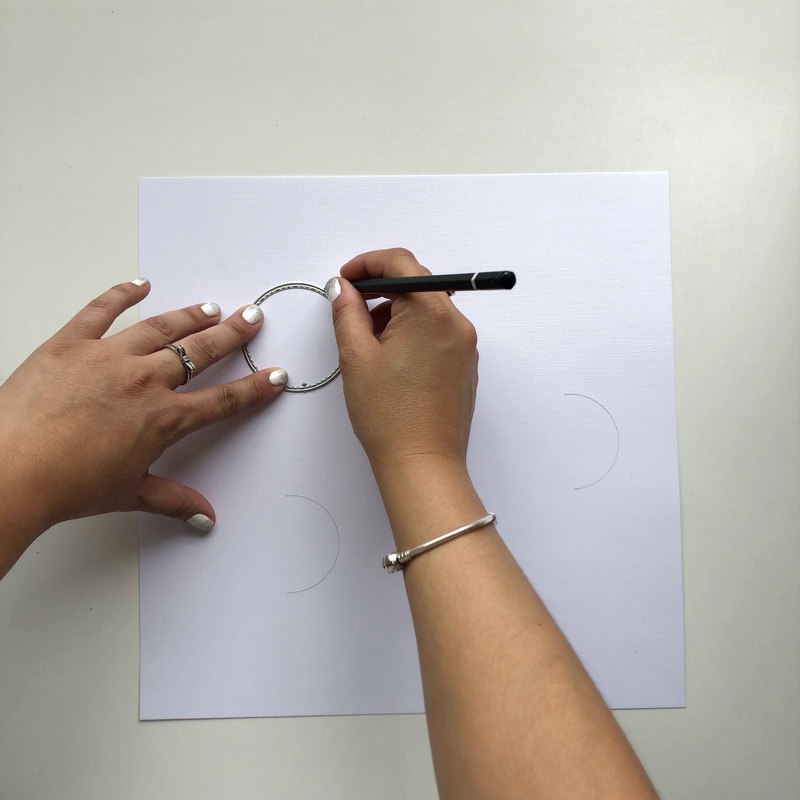 I really enjoyed working with Pebbles and hope you liked this idea and give it a try. If you have any questions, just let me know on a comment, or message me through my Instagram account @papelisima. Thank you for spending time with us here, have a lovely day! 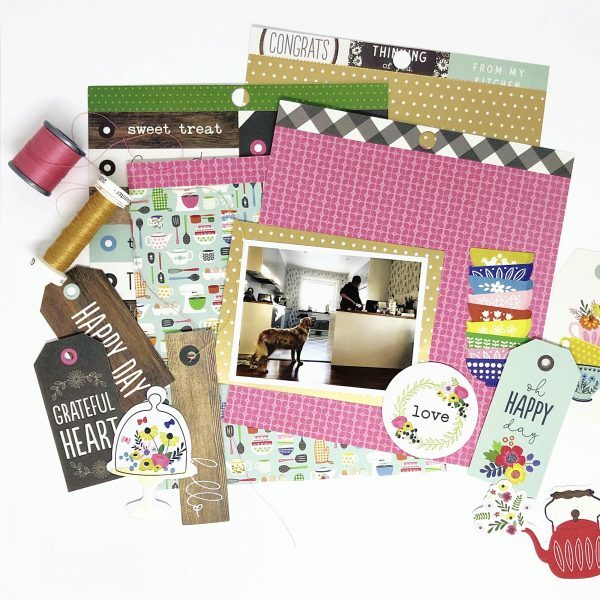 I’m Anna Edman, one of the January Guest Designers. Today I’ll show you a layout made with some 6” papers and ephemera from the collection My Bright Life. I often start my process by picking some papers and embellishments that match the photo. In the end, some things may not be used and something else has appeared. 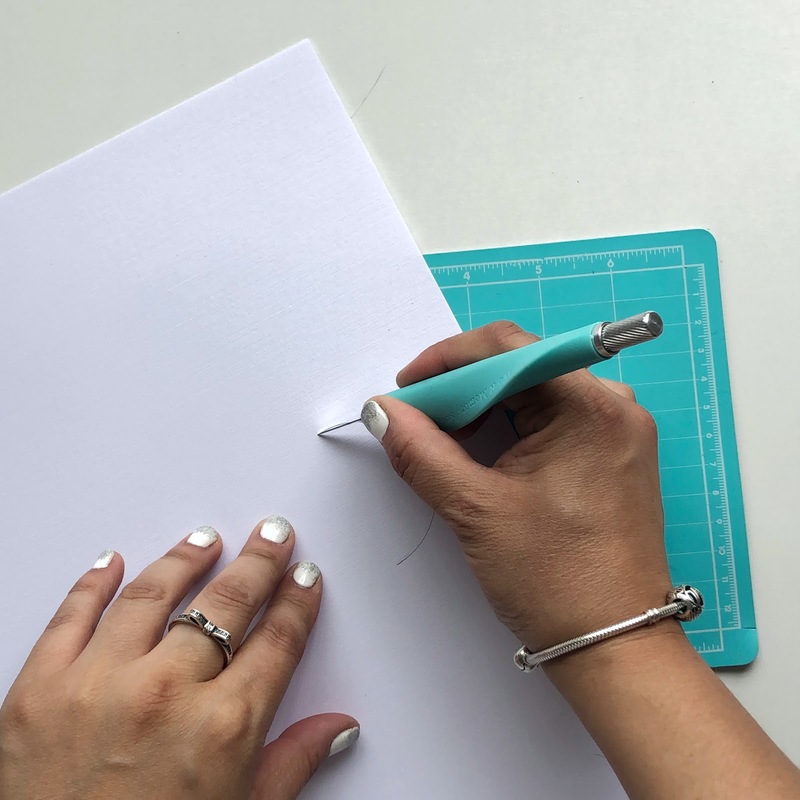 As my son was in the kitchen, I had to use the cute paper with kitchen utensils. 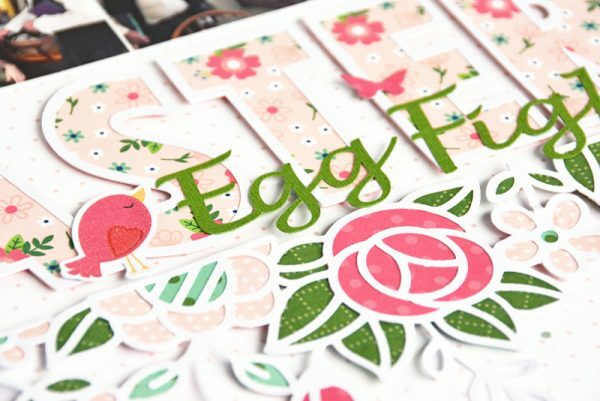 I trimmed down the patterned papers to the size I wanted to have and placed the ephemera pieces. The placement of the ephemera is a ongoing process and I adjust them until they are adhered. I adhered the papers and did some machine stitching on them to get some texture. After that, I adhered the ephemera and the title, Doris, which is the name of the dog. I like to build up layers and add some more texture to my projects, so I often adhere some pieces with foam tape and add some sewing thread underneath. I made a short video with some more photos and you’ll find it HERE. Find more from me on my Instagram as well HERE (@mavvek). 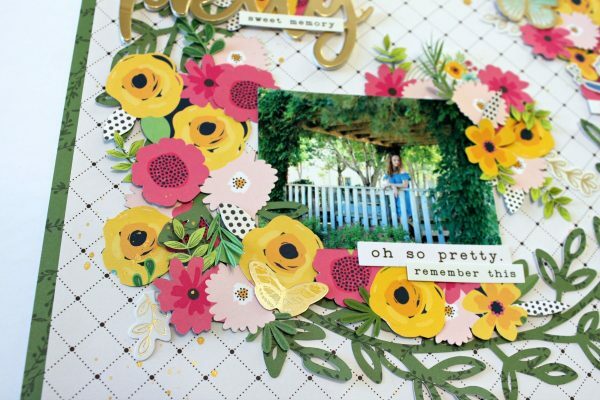 A day in the flowers with Guest Designer Michelle! 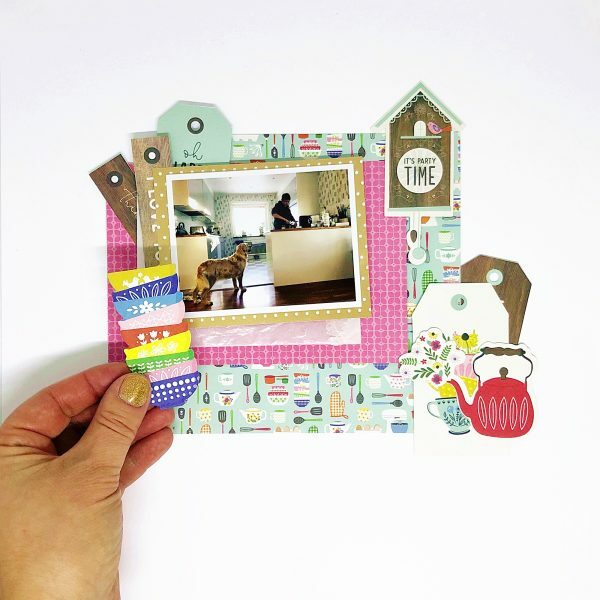 Hey everyone, Michelle Gallant here and I’m so excited to be a guest designer at Pebbles this month! 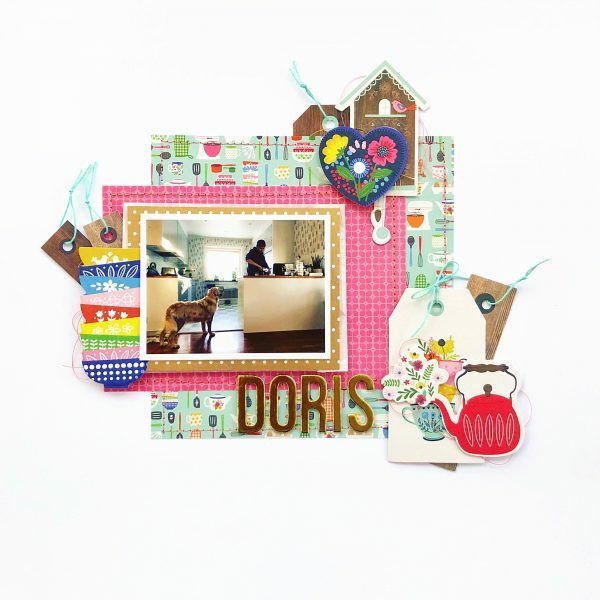 I was asked to create a LO using any of the recent Pebbles collections. Oh the possibilities!!! I finally settled on a mix of Patio Party and Along the Way. They are both such pretty collections and they compliment each other beautifully. 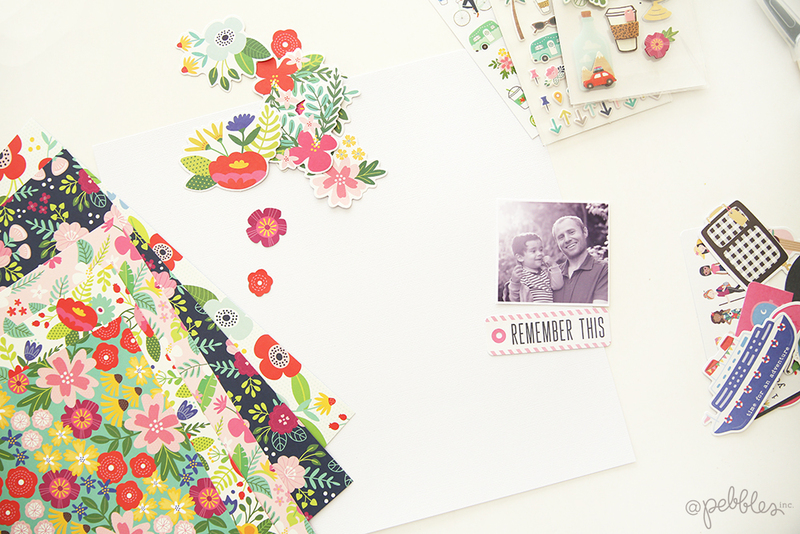 I love to fussy cut my patterned papers, so I’m always looking for papers with big florals. 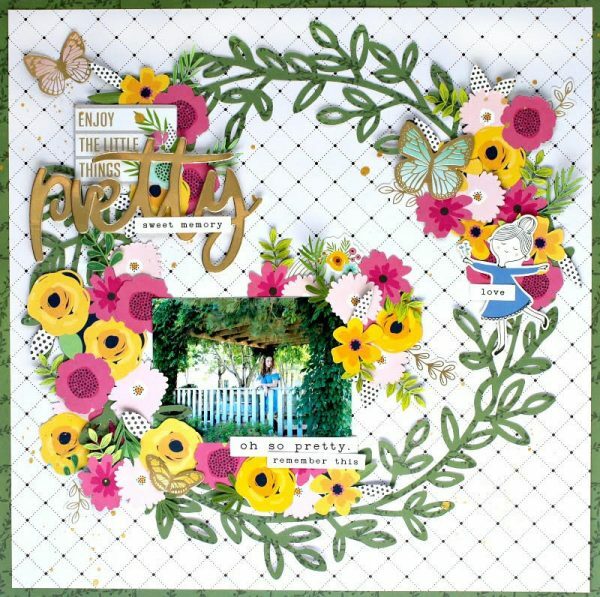 For this LO I used the Bouquets paper from the Patio Party collection. 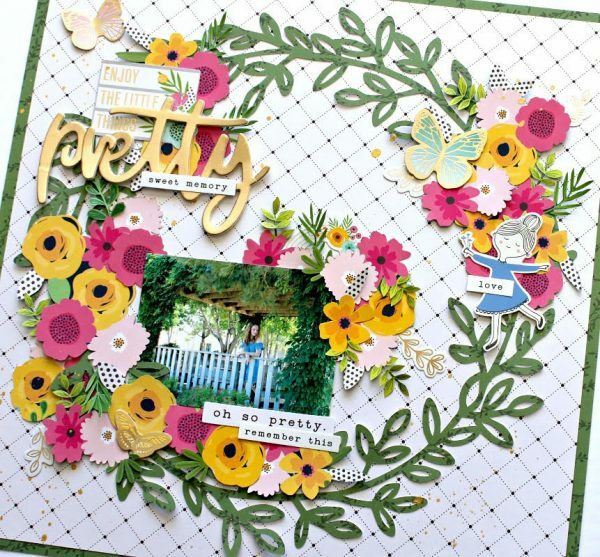 I fussy cut a little more than half of it and added the flowers to this cut file from Paige Evans. I like to add a lot of sayings and quotes to my LO. These little stickers make it so easy to do so. Phrase thickers are my favorite thing. I don’t even know how I managed to title my LO’s before these were invented. These gold ones are so pretty! I just had to add this little cutie to my LO! She matches my daughter with her blue dress. How cute is she? 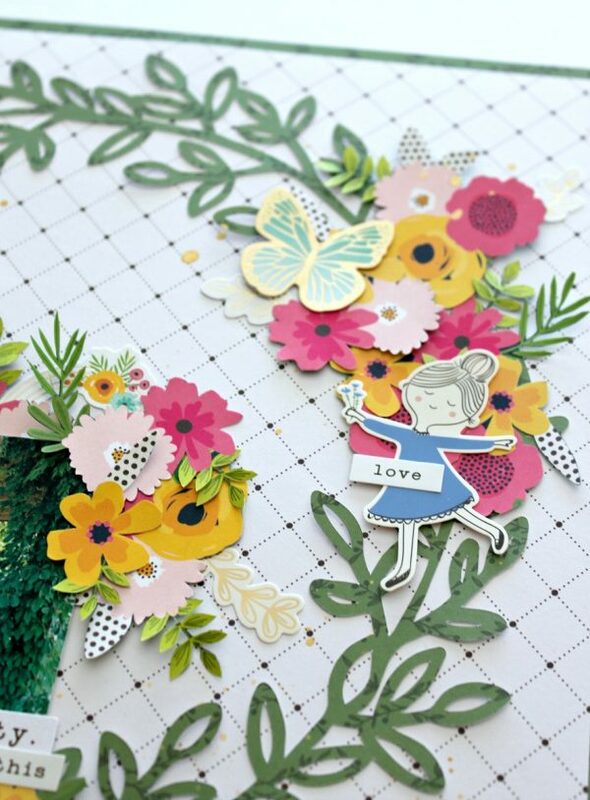 Here’s a closer look at the fussy cut flowers. I really like the texture it creates when they are layered.